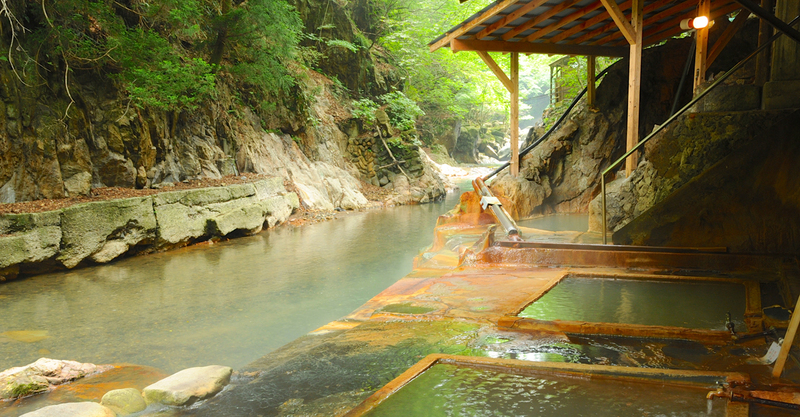 A famous leading Kanto onsen surrounded by nature. Shiobara Onsen Village can be reached in approx. two and a half hours from Tokyo by Tohoku Shinkansen and bus. Despite being within easy reach of the city, it offers an abundance of rich nature. But that’s to be expected, as 80% of the area of Shiobara Onsen Village is forested. You can enjoy the beautiful flowers nature brings forth each season, and it also comes recommended for its drive up from the city. Shiobara Onsen Village, centered on the course of the Hokigawa River is dotted with what are known as the “Eleven Onsen of Shiobara”, namely Oami Onsen, Fukuwata Onsen, Shiogama Onsen, Shionoyu Onsen, Hataori Onsen, Monzen Onsen, Furumachi Onsen, Nakashiobara Onsen, Kamishiobara Onsen, Arayu Onsen, and Motoyu Onsen. In other words, it’s an onsen paradise. As a single area offering onsen of such diverse water qualities and constituents bubbling up from the ground is rare even within the country, and you have the benefit of choosing which type of onsen you wish to bathe in.